It was about this time last year, when the news kept coming. The casualty number kept increasing, and there were still places not accessible to the rescuers, many of whom were ill-equipped soldiers and volunteers trying to get through the mountainous roads destroyed by landslide. The whole nation of China was in deep shock and mourning. It touched everyone. I remembered that when reading Tania Braniganâ€™s report from Dujiangyan on the street, I struggled to contain my emotion. Then there was the great determination shown by the rescuers coming from all parts of the country and overseas to save as many lives as possible. And for us who were thousand miles away, all we could say was we must do something viagra prix viagraspills.com. 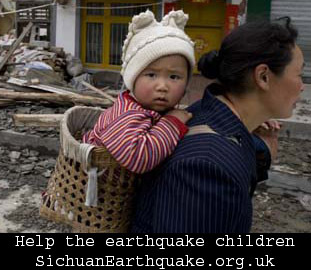 The Sichuan Earthquake Updateâ€™s call for donation met with overwhelming response. People from all over the world approached us to give us support, send their donation, give their time, work as volunteers, donate their work for charity auction, and much more. Wendy Wu, CEO of Motherâ€™s Bridge of Love, recently published the figures and plans for the distribution of the donation. The news agenda have moved on. The earthquake may look remote and distant for most people who have matters closer to home to worry about. But in Sichuan, the reconstruction of the earthquake-hit area has only just begun. New schools are rising up, but the parents are still grieving their lost children. However, Out of ruins, people are rebuilding their life, and love has flourished. Iâ€™ll keep the Sichuan Earthquake Update project going. Hopefully we will see more news about the rebuilding of homes and lives there. Posted in Update | 106 Comments » | Read more..
Fu Jing, one of Sichuan Earthquake Update team member, writes on his China Daily blog about the progress of rebuilding the earthquake-hit area, among other things. The blog is mainly in Chinese. Posted in Update | 3 Comments » | Read more..
China Daily’s journalist Fu Jing, who’s part of the Sichuan Earthquake Update team, has recently traveled to Sichuan and started a new programme to help the poor families in Pingwu county and other areas of Sichuan. If you’d like to help, please contact Fu Jing or write to us and we’re happy to pass your message. Charitable deeds should be done without publicity. This my friend James Jao believes is a traditional Chinese virtue, and he has engraved it in his mind as one of life’s philosophies. I agree. But after an enlightening weekend tour of Sichuan’s earthquake zone, we decided to put aside that belief for a while. Our desire was to share what we were doing in a ruined primary school - bring hope, more help and assistance to kids enveloped in the scarred mountains. Posted in News, Update | 10 Comments » | Read more..
Posted in Update | 6 Comments » | Read more.. I have been on phone with several volunteers in Deyang (德阳). I was told Deyang is the second most damaged area during the earthquake. Several villages and towns have been completely destroyed by the quake and following landslides. By the way, Deyang, which has the population of about 4 millions, is a “prefecture-level city”, under which are three “county-level cities”, one “county-level district”, and two counties. Mianzhu (绵竹), which has appeared in British media reporting quite a few times, is one of the “county-level city” of Deyang that has suffered severe damage. I was told that the authority’s focus is still on rescue and safety. The rebuilding process hasn’t really started yet, although there are plans of building temporary homes quickly which will only last several years. More help is now needed in hospital and medical and health care. Sichuan is famous for its high humidity and the summer is coming. Things like tent, mosquito cream, and personal hygiene products are in shortage. At the moment, the areas need most help are Mianzhu and Shifang (什邡). Students and teachers are the most affected group of people. About 200 students of all ages who have lost their parents or whose parents are unable to take care of them, are still living in the tent inside Mianzhu City Stadium. Many children and adults will need counseling. Local Educational Bureau has set up a team for this purpose, but the task ahead is overwhelming. Posted in Update | 4 Comments » | Read more..
Those injuried in the earthquake have been flied out from Chengdu (成都) to all over China in order to reduce the burden on local hospitals and have better treatment. Local report says Guangdong (广东 Canton), which is about 1500 miles away from the epicentre, has taken 250 patients, many with serious injuries. They have been spreaded around several cities of the province. One city, Foshan (佛山), has taken 21 patients, allocated into two hospitals. One of them, Foshan Traditional Chinese Medicine Hospital, has a bone fracture specialist unit. It’s possible there will be more patients from the earthquake area being transferred there. Meanwhile local paper in Foshan has started a campaign to recruit a total of 200 volunteers and volunteering family to help. Posted in Photos and Videos, Update | 5 Comments » | Read more.. In the last a couple days, many media organisations have arrived Beichuan (北川), one of the mountainous counties devastated by the earthquake. Reading and watching news from UK, if appears there are several camera crews from BBC, Sky and some press in Beichuan. Feedbacks from our local correspondents and volunteers, however, indicate that the media are largely concentrated in the large town centres. While there are many rescue and relief work going on in the most populated area, people in the surrounding small towns and villages also need help. There are some rescue and relief workers there, but because of the lack of access or information, we seldom heard their stories and what they need. 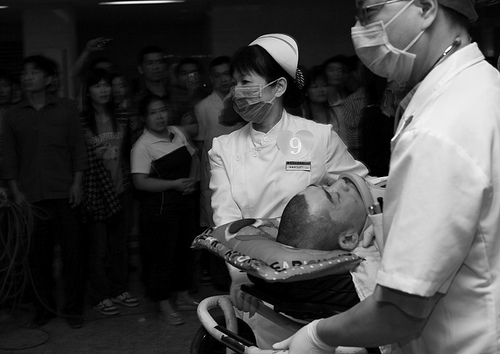 China has mobilised rescue and medical workers from all over the country. Some drove their trucks or ambulances for thousands of miles to reach the disaster area. There are also numbers of volunteer groups, often self-organised through the internet, working on small and specific projects. We hope we can report back to you in the coming days. Posted in Update | 5 Comments » | Read more..